One of the things I've found blogs useful for is to push me to write about things I don't have time to work on in more depth. That may sound sort of slipshod, but it's been a way for me to continue tying together various interests and bits of research in the midst of teaching and other work. Especially with the research that relates to energy use and climate change, this feels compelling enough to make some room for in the midst of a too-busy schedule, and important enough that doing it in even a small-scale and scattered way seems better than not doing it at all. I'm pushing myself even a bit farther out on the limb this weekend by launching a little community history project in Wendell, Massachusetts, where I live (and which I wrote about in an earlier post). I'm calling this the Wendell Food-Farm TimeMap, and it's designed to gather and consolidate more knowledge of the town's food and farming history, with an eye to informing some of the community discussions that have been going on here for many years about local resilience, self-sufficiency, and interdependence. 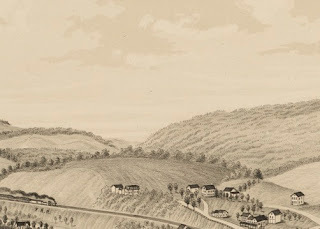 Tomorrow is Wendell Old Home Day, which is what I've been aiming toward as an official launch of this project. (For those who don't know, Old Home Days are a New England tradition that emerged around the turn of the 20th century in depopulated, often rural places trying to mobilize sentimental connections--very often centering around farm life--among people who had left, with an eye to drawing needed resources back into the towns. Now they're essentially just annual town fairs, where they still take place.) My plan is a pretty loose one, and I thought I'd set it out here as a way to sort of document things as they go along. One hope I have is that this might produce a useable template for people in other towns who might want to do similar projects, so I want to pay attention to what works and what doesn't. I'm thinking of this as a three-summer project: one summer to begin gathering data, one to build out from the initial materials and add to them with some additional research and perhaps interviewing, and a final summer to consolidate things in some form (probably a webby one) so it can be disseminated and perhaps added to in future years, if someone feels inspired to do that. To a large extent, this project is about finding out what people already know about Wendell's food and farm history. As much as anything else, I'm curious about that. So particularly in the first phase, my main task is just to try to talk to as many people as possible, and to use whatever they tell me as a guide to the next stages of research. 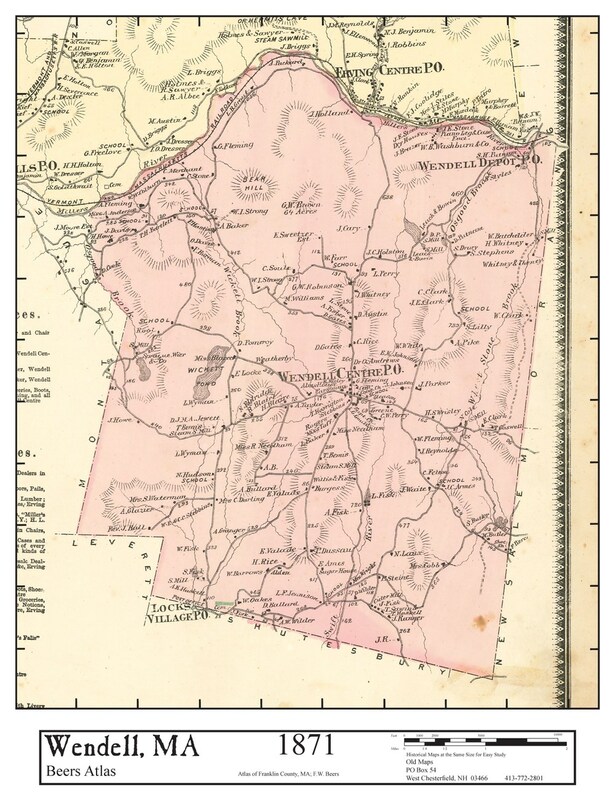 I'm planning to do that by setting up at Old Home Day and perhaps other events in the fall with a number of big laminated historical maps of the town plus a timeline that follows the general history of agriculture in the northeast. I'll ask people to add things to the maps and/or timeline, and will try to get contact information for people who want to share more of what they know and recollect. In future phases, as data gets added, the timeline can be more Wendell-specific and I can figure out a way to collate and display what people have told me so far (probably an indexed listing of names, farms, and properties, as I'm anticipating that that's how most people are going to find their way in to this). And that's pretty much it for now. It's a loose plan and I don't have a great deal of time to pursue it, so I'm trying to keep this as simple and feasible as possible (which may actually be a plus in terms of showing people elsewhere how it might be useful in their own towns). I've set up a Facebook page for the project and may also use my own website as a temporary online venue for materials relating to this once they start accumulating. I hope that they do, and that I don't lose my voice tomorrow (I've had a nasty cold for a week), and that I haven't over-reached too far in adding yet another thing to my plate. Stay tuned to find out! What would keep us from going down the same path to "big ag" all over again? As I've been pondering local food networks and activism over the past couple of years, one question keeps coming to mind. 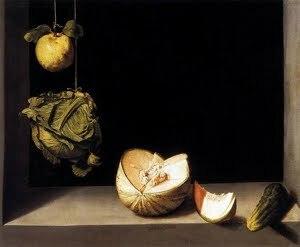 It's all very well to be rediscovering smaller-scale modes of production and consumption, but our current large-scale systems developed for reasons that seemed wise at the time (trying to help farmers make a secure living, make food more affordable, reduce the back-breaking labor of cultivating land). What would keep us from enacting the same cycle again, and ending up with just a nouveau version of today's "big ag"? How do we hold the line at things that work at a local or regional level, rather than letting market logic push things toward the national and global? As the networks of distribution and supply in the local food realm become more extensive, with "food hubs" and other intermediaries, aggregators, and specialized services of various kinds now appearing all over the landscape, this seems worth considering. What happened the first time around is that competition and economies of scale came to favor larger producers, companies, and distributors, beginning as early as the mid-19th century but really becoming entrenched after World War II. So if we're going to create and maintain small- and mid-sized systems, there needs to be something that can counter that trend toward bigness. 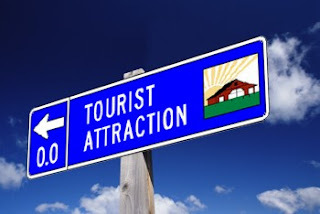 I spend a lot of time critiquing tourist-oriented development, so I feel a bit funny saying this, but I really think that tourism (and the whole repertoire of tourist-oriented techniques of publicity and experience-marketing) might help us here. I wrote about this elsewhere in relation to fuels, cars, and railroads, and I wonder if the same thing might apply to local food. At the moment, the case is being made for relocalizing/regionalizing in ways that are largely touristic, focusing on creating "hereness" and branded identities or products and locating local food within constellations of other heritage- and recreation-oriented attractions. But that's not to say that the infrastructure that's being built in the process won't have its own staying power if and when times get tough(er). Agritourism and selling experience rather than just food may not seem like smart strategies for the long-term survival of small food producers, but it's worth remembering that domestic tourism actually flourished in the Great Depression, as people saved money by taking vacations closer to home. More to the point, the emerging networks we're now seeing may be building systems and connections and knowledge that will be highly serviceable for robust local and regional food systems down the road. If present-day tourism helps us do that, then I'm all for it. And my assumption is that by the time we find ourselves finally facing up to the realities of a carbon-saturated, fossil-fuel starved world (the imminence of which is becoming more apparent every day), many of the "externalities" inherent in the national and global food systems that now feed us will have shown themselves to be "unsustainable" in the long run. The costs of obtaining oil, public subsidy of industrial food production and the transportation systems it relies on, reliance on below-market-value legal and illegal labor--our present way of producing food has multiple weak spots. We may wake up one morning to discover that the smaller-scale, less energy-dense, more reciprocal networks we've been putting in place have simply become the new way of doing business. So as corn and soy crops wither in this year's drought and Greenland's ice cap melts, the somewhat odd blend of people and motivations in the local food movement--boutiquey, nostalgic, and political in about equal parts--may offer some hope that in decentralized and sometimes contradictory ways, we're reinventing things right out from under the industrialized system. I was heartened to read a recent Wall Street Journal interview with the chef at the upscale Stone Barns Center, running along these same lines. "Five years ago," he says, "I would have said that locavorism was at its height and that a new fad was coming to replace it. Now I'm actually convinced we're just beginning to see its potential." As we also see the potential of extreme weather and growing competition for fuel and other resources, that's a hopeful thought to hold onto. I've fallen off the one-post-a-week wagon again, mainly because I ended up unexpectedly teaching a summer class and my time has filled up with prepping and grading again. It's actually been quite a lot of fun, and one of the things I've been enjoying is that the class is fairly small and the time block is long, so we've had a chance to go on some field trips around Boston. 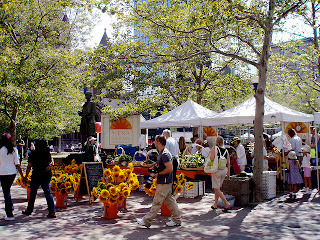 Yesterday we went to the Copley Square farmers market as part of our discussion of economic systems and exchange relationships, and I found it a useful check-in for thinking about where the new food movement fits in the trajectory of economic redevelopment in this particularly successful postindustrial city. The market fits seamlessly into the effort to create what Bella Dicks has called "visitability" and what Barbara Kirshenblatt-Gimblett has termed "hereness" for Copley Square and for Boston as a whole. 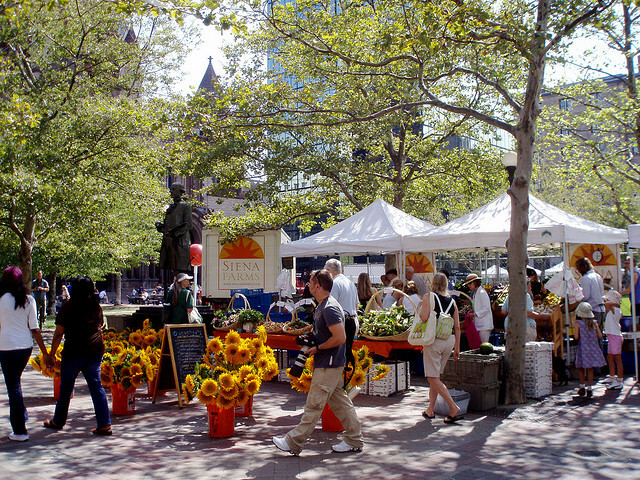 Although the sellers--particularly the farmers, as opposed to the more locally-based bakers and other specialty vendors--were mostly from central and even western Massachusetts, the presence of the market itself conveys a sense of being rooted in a specific place, which goes along with the iconic architecture (especially Trinity Church and the Boston Public Library, which anchor the square on two sides) and links with various pieces of local lore (especially the Boston Marathon, which finishes here and which is referenced in Nancy Schön's 1995 "Tortoise and Hare" sculpture, much photographed by tourists). The market itself is a tourist attraction of sorts, with an interesting relationship to visitors from both far away and within the city. The market manager, Ben Sommer, told me that the customer base includes a lot of people who work in the surrounding downtown buildings, but also many international tourists who happen to be in the square and many people from elsewhere in Boston who come downtown to do some of their food shopping (and, presumably, to run other errands or see other sights--an important part of the argument that organizers of farmers markets often make for their power of attraction and their economic "multiplier" effect). Overlapping with the nearby workers, tourists, and day-trippers were many people from the core demographic of farmers market shoppers: the well-educated, professional, mostly female, mostly white, mostly 30-to-50-year-old, leftist/progressive/environmentalist shoppers whom Peggy Orenstein has labeled "femivores" (see "The Femivore's Dilemma" in the New York Times Magazine, March 14, 2010) and who embrace the chance to shorten the food chain as a pragmatic expression of their political and social values. My students were struck by the way that two groups of market "extras" were working the particular sensibilities of this crowd: panhandlers and petition-pushers were equally active in approaching market shoppers, both clearly seeing opportunities to mobilize uneasy liberal consciences or righteous liberal indignation. Both Bubinas and Gagné point to the ways that farmers markets and postindustrial urban redevelopment can complement one another, for better and worse--creating a potentially politicized alternative to purely commoditized food exchange, on the one hand, or playing into purely consumption-oriented revisioning of urban spaces, on the other. I've spent a fair bit of my own time critiquing the latter, but like others who are now focusing ethnographically on new food activism, I'm heartened by the sense that the potential for real change exists even within touristic or consumerist market projects. Maybe it was just the exemplary gluten-free brownie that I scored at one of the booths, or the beautiful weather yesterday, but I left the place mentally agreeing with Rachel Slocum, whose 2006 article "Whiteness, space and alternative food practice" (Geoforum 38:520-533) I also assigned as a reading for this class, that these markets may be spaces where the exclusionary can coexist with the transformative, and where we as scholars might lodge critiques that are sharp without being unproductively harsh.